From Navel and Valencia to Cara Cara and Blood oranges, every Sunkist® orange is bursting with vivid color and sweet, juicy flavors. Navel oranges are named for the small, navel-like formation on their blossom end. Refreshingly sweet and juicy, Navel oranges have a pleasant floral aroma. The slightly thick skin peels easily, revealing a seedless interior. 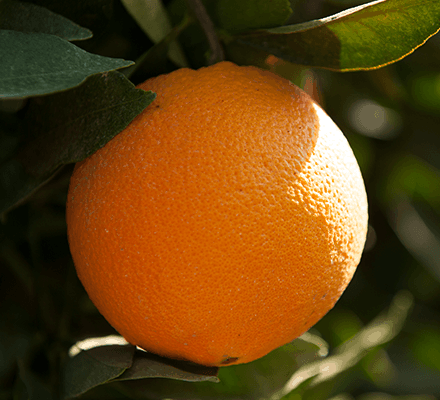 Navel oranges are available from November through June. The perfect, juicy blend of tart and sweet. Love OJ? Thanks to a perfect, juicy balance of tart and sweet, Valencia oranges are just right for juicing. This orange’s bold, refreshing zing is tempered with just the right amount of sweetness. Even though the fruit may be deliciously sweet and completely ripe, Valencia oranges occasionally "re-green" in warm weather as the peel reabsorbs chlorophyll, causing a ripe orange to look partly green. Often called the summer orange, Valencias are available from February through early November. Cara Cara Navel oranges offer the most vitamin C of the Sunkist citrus varieties, with 100% of the recommended daily intake in just one orange. Cara Cara Navel oranges are known for being extremely sweet with slightly lower acidity than regular Navels. They may look like Navel oranges on the outside, but the seedless interior has a rich pink hue due to the natural presence of lycopene. Cara Cara Navel oranges are available from December through May. A burst of color in every bite. Blood oranges get their name from the deep color of their interior. Blood oranges offer a distinct, rich orange taste with a hint of fresh raspberry. The thin orange or red blushed skin reveals a beautiful, deep maroon interior. Blood oranges are available from December through mid-April. The best temperature range for oranges is between 45° to 48° F.
Sunkist® orange size designations, printed on every carton, state the number of oranges in the carton, and indicate the size of the individual fruit within. For example, a carton of “88s” contains 88 medium-size oranges. A carton of “138s” holds 138 small-size oranges, while a carton of “48s” contains 48 very large oranges.